Breast cancer is frightening enough without the fear that it could travel to other parts of the body. Metastasis is the term for the spread of cancer. About 250,000 women are diagnosed with breast cancer and roughly 40,000 will die from the disease each year. When breast cancer is diagnosed in the early stages, many women go on to live cancer-free lives. Yet for others, the disease is metastatic at the time of diagnosis or later recurs. It's thought that metastatic disease is responsible for around 90 percent of the deaths related to breast cancer. How does breast cancer spread or recur? The risk that breast cancer will recur or spread is correlated with the size of the tumor and extent of spread at the time of diagnosis. For roughly 20 percent of women, breast cancer is diagnosed at the very earliest stage. Stage 0 breast cancer or carcinoma in situ is considered pre-invasive breast cancer. Since these earliest cancers have not spread beyond something called the basement membrane (they have not moved beyond the breast ducts), surgery should theoretically cure these cancers. Another 70 percent of people are diagnosed with invasive breast cancer which has not metastasized (spread to distant organs). These breast cancers, which are considered stage 1 to 3 cancers, may have spread to lymph nodes but are not present in other organs. With treatments such as surgery, chemotherapy, radiation therapy, hormonal therapy, and/or targeted therapies, many of these tumors will remain at bay. The risk, however, that they will appear again (recur) is greater with higher stages and if lymph nodes are involved. Less 10 percent of women are diagnosed when cancer has already spread to distant areas of the body. Breast cancer is most likely to spread to the bones, liver, lungs, and brain. When breast cancer recurs at a distant location it is no longer curable but is still treatable, and treatments can both improve symptoms and extend life. Many people fear the recurrence of breast cancer, but most are able to find a balance between being aware and being paralyzed with fear. It's common and normal to have a heightened awareness if you develop symptoms of possible spread after having primary breast cancer. A headache is likely to be just a normal headache, but the thought of brain metastases may come to mind. Likewise, an ache in your back might make you worry about bone metastases while it's far more likely that you slept wrong. It's important that every woman (and man) who has had breast cancer be knowledgeable about their expectations. Your oncologist can help you understand these based on your specific cancer, its stage, and other characteristics. Having a heightened awareness can ensure that you follow-up with the appropriate visits and know when to call. If the fear becomes emotionally crippling, however, a cancer therapist can be priceless in helping you maintain the balance between being conscientious and fearful. Through the lymph system: Breast tumor cells may dislodge from the tumor in the breast and enter tiny lymphatic vessels which are present throughout the breasts. From there they can be carried through lymphatic channels to lymph nodes and beyond. It is lymphatic spread which is an important part of the diagnosis and staging of breast cancer. If a tumor has spread from the breast to a sentinel lymph node (if the cancer is lymph node positive) it has essentially "declared" its intent to spread beyond the breast. People can be very confused if they read their pathology reports. If cancer has spread to nearby lymph nodes, the report might state "metastatic to lymph nodes." This does not mean that you have metastatic breast cancer, and even some early stage 1B breast cancers may have lymph node involvement. Through the bloodstream: Just as there are tiny lymph vessels throughout the breast there are many small blood vessels. Cancer cells may invade these tiny blood vessels and be carried through the bloodstream to distant locations, especially areas such as the lungs and liver which have large blood flow. Local invasion: Breast cancer may also spread into nearby tissues such as the chest wall or ribs by invasion. 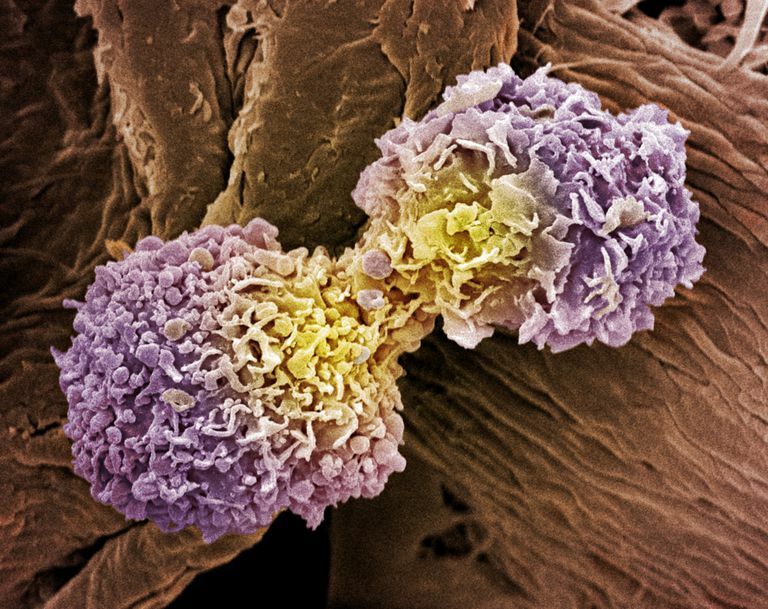 Cancer cells are different than normal cells in this way. Benign tumors may grow and press on nearby tissues, sometimes causing damage. But cancerous tumors actually invade these tissues. In fact, the term "cancer" is derived from a Greek word meaning "crab" to describe the crab-like extension of cancers into nearby tissues. When breast cancer spreads to another organ it is still breast cancer. For example, if breast cancer were to spread to the lungs it would not be called lung cancer. Instead, we'd refer to it as breast cancer spread to the lungs or breast cancer with lung metastases. If you were to look at the cancer cells in the lungs under the microscope they would be cancerous breast cells, not cancerous lung cells. Cancers that have spread to other tissues may be different than the original tumor, and this is another area of confusion. Cancers aren't just a clone of abnormal cells that propagate mindlessly. Rather, they are continually changing and developing new mutations. For this reason, a tumor which was estrogen receptor positive when found in the breast may now be estrogen receptor negative. HER2 status may change as well. This also explains why metastatic tumors are sometimes more aggressive than the original tumor. You may be wondering why breast cancer cells travel at all. Or, why normal cells don't spread around our bodies. Cancer cells differ from normal cells in many ways. One of these is that normal cells have what is known as "adhesion molecules." These adhesion molecules act like glue and keep cells where they belong in a particular part of the body. Normal cells also have "boundaries" or ways in which cells communicate with each other. This is like one country saying to another "you don't belong here." Cancer cells, in contrast, don't respect these cellular communications, essentially ignoring the "fences" between different tissues. Yet another confusing topic when talking about breast cancer spread is why it can happen years or even decades later. We know that, especially with estrogen receptor-positive breast cancers, cancer can seemingly disappear only to recur many years after the original tumor. Nobody is certain exactly how this happens, but there are theories about recurrence that suggest that some breast cancer cells are hardier than others and that these cancer "stem cells" are able to lie dormant even through treatment. If you have metastases you may or may not have any symptoms. Some metastases are found on screening tests, such as a bone scan or PET scan. Since these tests may detect metastases, women with early-stage breast cancer may wonder why routine follow-up scans are not done. The reason is that though metastases may be detected sooner by screening, finding these areas of spread before you have any symptoms does not improve survival. General symptoms of metastatic breast cancer may include a feeling of being unwell, unintentional weight loss, or a decrease in appetite. When breast cancer spreads to the lungs it may cause shortness of breath and a cough. Liver metastases due to breast cancer may result in abdominal discomfort and jaundice, a yellowish discoloration of the skin. The most common site of breast metastases are the bones, and symptoms usually include pain. Sometimes the first symptom is a pathologic fracture, a fracture which occurs through an area of bone weakened by the tumor and often caused by minimal trauma. Brain metastases can cause symptoms such as a headache, blurry vision, weakness, and numbness, or seizures. Knowing this, women who have had early-stage breast cancer may become nervous if they develop any of these symptoms. It's important to remember that women who have not had breast cancer get headaches too. But be gentle with yourself. Those who have not had breast cancer may tease you about your concerns related to new aches and pains, but those who have had breast cancer will get it. If it takes getting a symptom checked out so you can relax, make sure to do so. Doctors have several ways of determining whether cancer has spread or not. These involve imaging the body using x-rays, bone scans, MRIs, CT scans, or PET scans. Blood tests can check levels of certain chemicals in the blood, including specific tumor markers associated with metastasis. Also, physicians often rely on biopsies, which are tissue samples gathered by surgical removal or needle extraction. These samples are then examined under a microscope for cellular abnormalities that indicate whether there is a progression of cancer. When breast cancer becomes stage 4 (metastatic) it is no longer curable but is still very treatable. Treatment options for metastatic breast cancer include chemotherapy, targeted therapy, osteoporosis medications, hormonal therapy, and newer treatments such as immunotherapy drugs in clinical trials. Isolated metastases, such as those to the brain, are sometimes treated with surgery or radiation therapy. In general, the goal of treatment is very different from metastatic breast cancer compared with earlier stages of the disease. With early-stage disease, treatment is often aggressive with an aim for curing cancer. With stage 4, however, the least amount of treatment to control the disease is usually the goal. Aggressively treating this stage does not improve outcomes but does increase the risk of side effects and a poorer quality of life. A small percentage of women have metastatic breast cancer at the time of diagnosis, but more often metastases are a distant recurrence of prior early-stage breast cancer. The chance that cancer will recur depends on many factors. The fear of recurrence may leave some people feeling anxious, though most of the time people are able to find a balance. Some degree of concern is important in helping women (and men) follow through with recommended treatments and follow-up. Cancer can spread locally to nearby tissues or through the lymphatic tissues and blood. Since it is the spread of breast cancer which is responsible for most deaths from the disease, many researchers are looking into the reasons why cancer cells may spread and what may hinder them from doing so. American Cancer Society. Breast Cancer Facts and Figures 2017-2018. Muzes, G., and F. Sipos. Metastatic Cell Dormancy and Re-Activation: An Overview on Series of Molecular Events Critical for Cancer Relapse. Anticancer Agents in Medicinal Chemistry. 2017. 17(4):472-482. National Cancer Institute. Metastatic Cancer.